At first glance, the specimen on the right appears to be an unremarkable fossil bear bone. But Museum intern Anna Dewar discovered that there might be more to it than meets the eye. Could this bone be linked to a great controversy involving fossil humans and the discovery of the world’s first Neanderthal? In 1829, Philippe-Charles Schmerling discovered human bones alongside fossilised bear, rhino and hyena skeletons in a cave near Liège, Belgium. 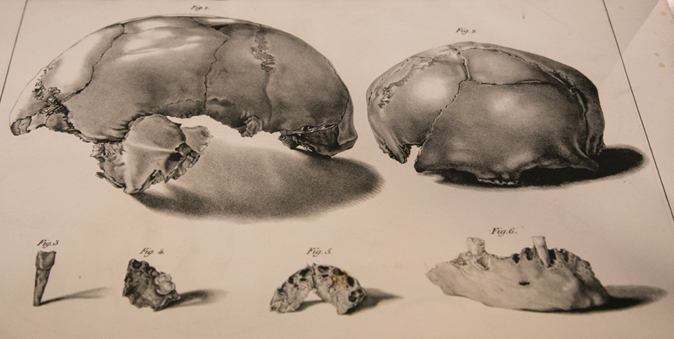 Concluding that the humans had lived alongside the animals, and were also fossilised, he presented this ground-breaking idea to a group of scientists including William Buckland, Oxford’s first Reader in Geology. When Schmerling tried the same test with one of the human bones, he could not make it stick and he was left humiliated. Sadly it was not until after his death that scientists realised Schmerling had indeed found fossilised human remains after all, including those of a Neanderthal child. What was he doing? At the time this ‘tongue test’ supposedly related to the mineralisation of the bone: if it stuck to your tongue, it was a fossil; if it didn’t stick, it was bone. This illustration shows one of the partial human skulls discovered by Schmerling in a cave near Liège, Belgium during the winter of 1829–1830. Schmerling was the first scientist to show that humans had co-existed with extinct prehistoric animals such as mammoths and woolly rhinos. But Schmerling’s discoveries of fossil humans caused great controversy at the time, and it took decades for other scientists to agree with his ideas.